One of the things that always annoys me about my fellow Brits is that they will keep banging on about the second world war. Any football international between England and Germany brings wartime references out in the tabloids. 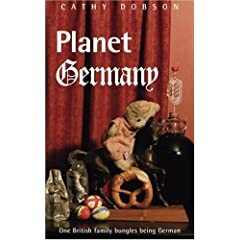 Several interviewers who talked to me recently about Planet Germany brought up questions about the second world war…. even though it’s barely even mentioned in the book. So it wasn’t a surprise when someone reminded me today of one of those great ads from our youth. What did surprise me was that despite the fact that I’m the biggest critic of English people who constantly talk about the war…. it’s had me chuckling all afternoon. Guess I’d better go and wash my mouth out with soap! All grown up and ready to move house! The kittens are all growing up now… and it’s utter, total mayhem in our house. Wherever you try to step….wherever you try to sit down, there’s a kitten there already. By the time you’re reading this post I’ll probably have broken my neck. Even something as simple as putting a box on the floor with old newspapers for recycling seems to attract a horde of kittens… it’s like having a toddler’s birthday party in your home day-in-day-out. Here’s the scene in our living room earlier. 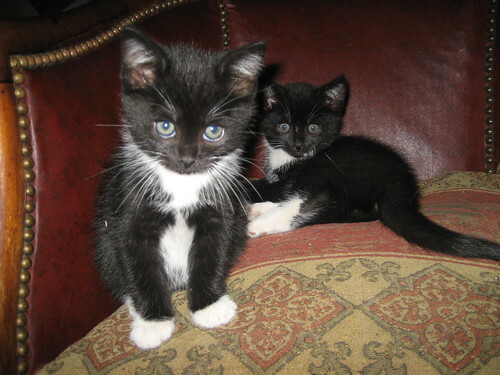 A few people have left messages asking whether any of the kittens are available for adoption… the answer is yes. We’ll keep two of them – but the other three are looking for good homes. They’re all males – and even I think five is too many tomcats for one house! 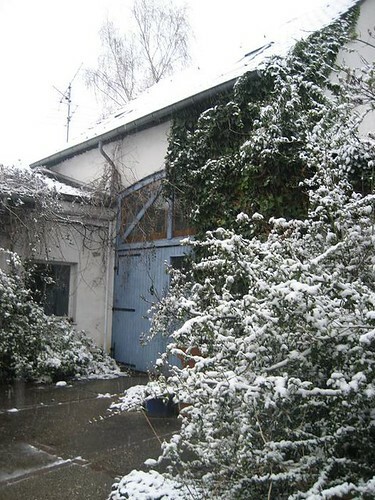 Leave a message if you’re seriously interested in giving a home to one of them (and live somewhere around Düsseldorf). What has happened to our weather? 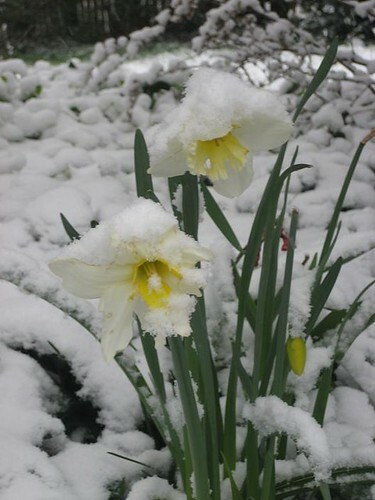 Christmas was so mild… and then all of a sudden at Easter… this! 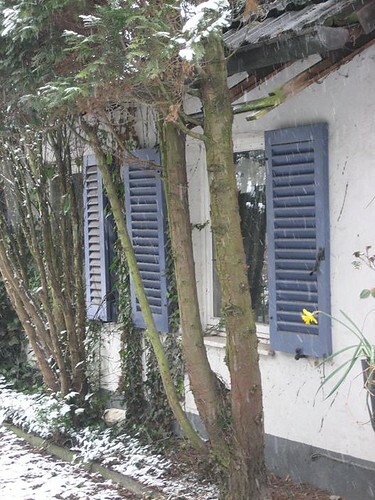 Our farmhouse was just starting to look Spring-like with all the daffodils… and suddenly we’re covered in a dusting of unexpected snow. 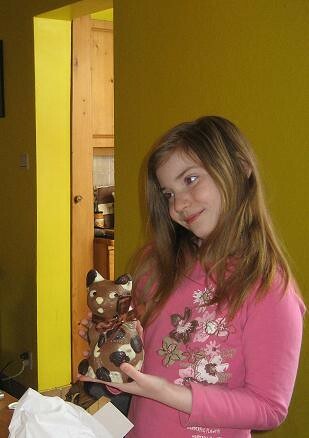 It was a wonderful chocolatey Easter. …but who got the biggest? 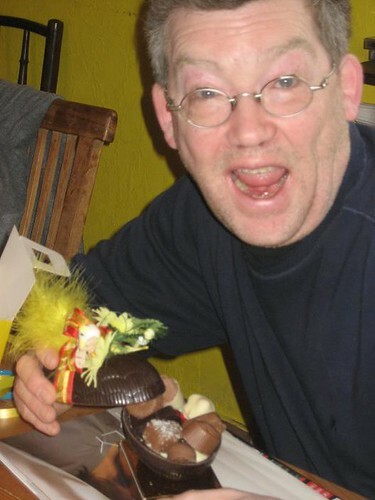 Dad’s egg turns out to have a surprise filling… wahey! First, I am addicted to flea markets. I love them… I spend every other weekend rummaging around other people’s cast-offs looking for wonderful treasures that I can pick up for a couple of Euros. And my house is full of them. Ignorant Philistines (most of whom I am related to) would call it junk…. but I know it’s valuable treasure. Second, I’m a chocoholic. I love chocolate – I love everything about chocolate – from the way it melts on your tongue to the last bittersweet lingering aftertaste…. So it won’t surprise anyone that I am in posession of a modest but growing collection of old chocolate moulds gleaned over the years from the detritis of German house-clearances and yard sales. Most of these have an Easter or Spring theme because in Germany (Oh joy! Oh joy!) 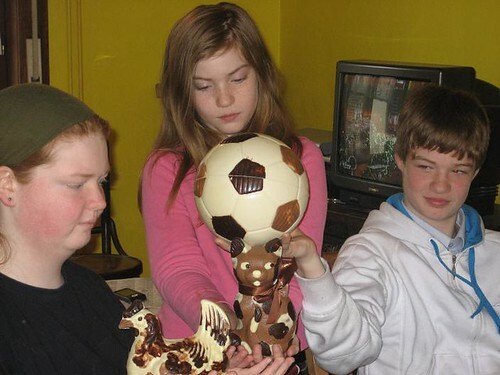 Easter is celebrated in chocolate. 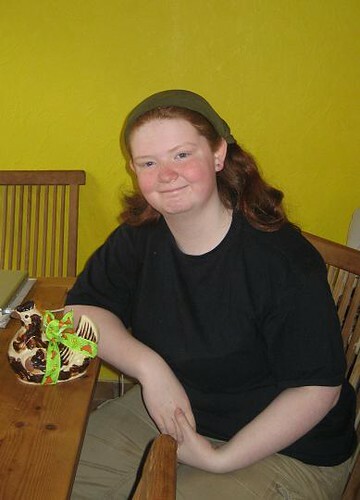 Now, before you get all excited and think that Hausfrauen all over Germany are putting on their pinnies and stirring vats of chocolate on the stove, I should point out what Birgit informs me on this subject. But I know Birgit is wrong on this. Making your own chocolate rabbits for the children at Easter is pure unadulterated Motherhood. It will make me an Über-Mutter… a veritable Goddess in the eyes of my children. 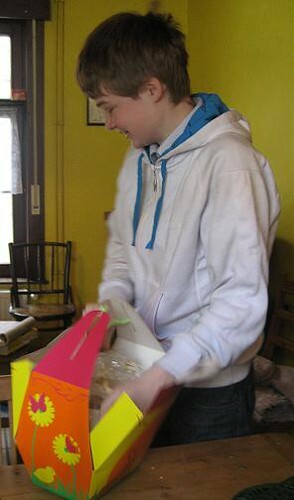 They will stop being recalcitrant adolescents and will see me in a new light…. Anyway – time to get started. I’m using milk chocolate this time – not my personal favourite (I’m a dark-choc-with-a-hint-of-grated-orange-peel person myself) but this is a sacrifice I can make for my offspring… willingly…. just a little taste then…mmmm…. 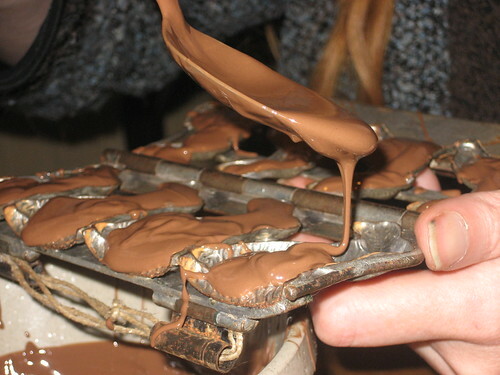 Once the chocolate has melted, you have to get it into the moulds. This sounds easy… and in some cases it is pretty straightforward. 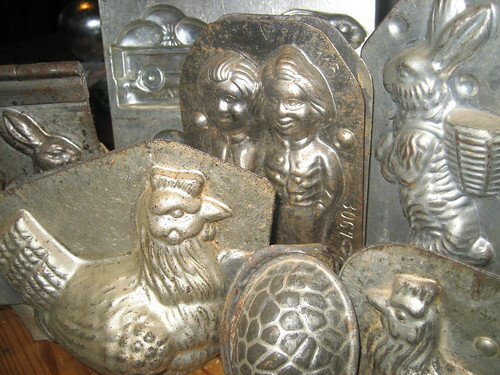 I can tell instantly which moulds were designed for the German Hausfrau with a sense of Ordnung in her kitchen…. 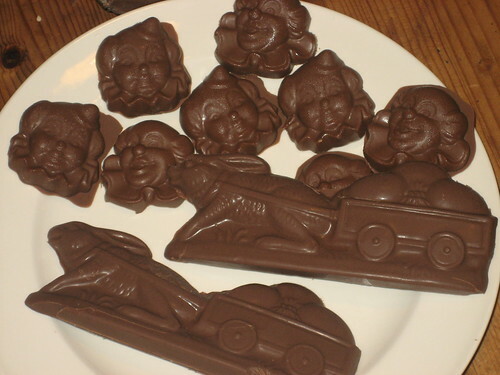 Some of the other ones are designed specifically for the chocoholic Mum…. 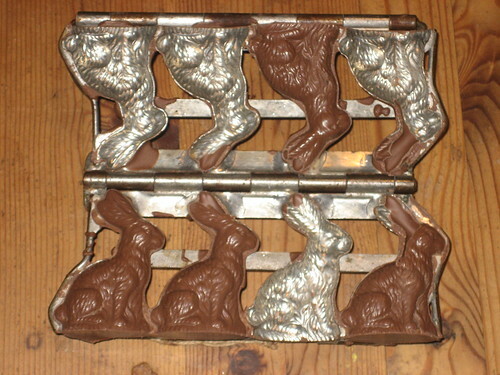 they are all holes and no mould, so aiming the chocolate into the rabbit-shape is nigh on impossible without it dribbling all over your fingers and ensuring that you have to lick it off. Don’t you just love hate that? 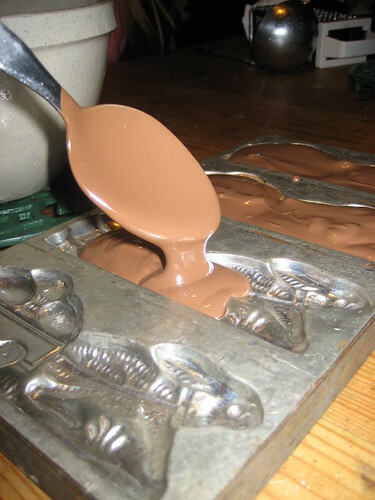 Once the chocolate is in the moulds, they go into the freezer for a short time to set, while the chef licks out the bowl…. 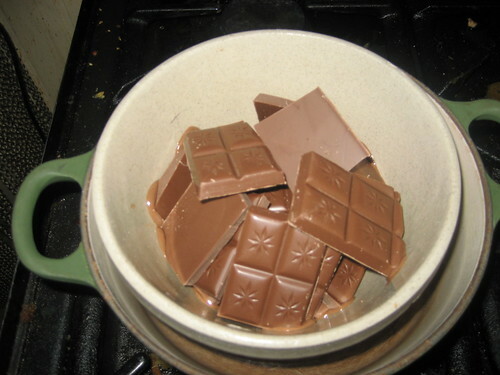 Now… I’d better make some for the kids next…. 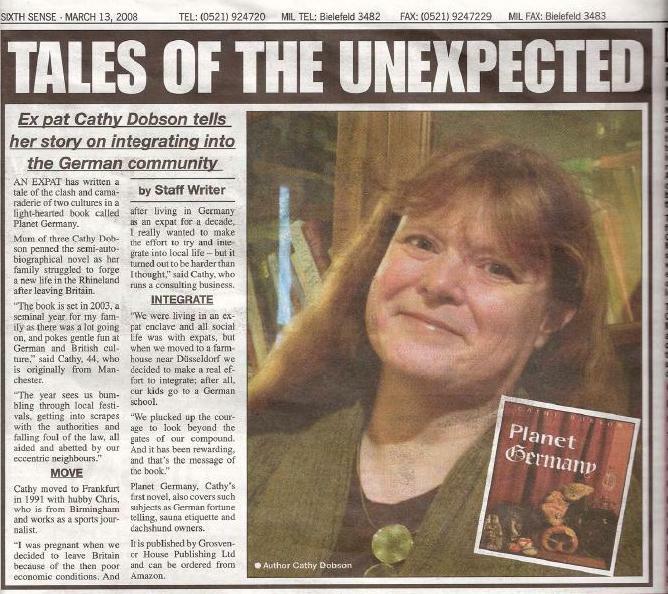 If Germans don’t learn English…. one day it’ll come back to bite them. (Okay – the first example comes from Holland… but it still applies).